Properties in Sicily average 4.6 out of 5 stars. Holiday House "Stella the Sea"
Property 11: Holiday House "Stella the Sea"
Property 13: Villa on the sea: 5 beds, 1200 sqm, garden, parking, free wifi, washing machine. Nice detached house with private pool near the sea. No cleaning fees. Property 15: Nice detached house with private pool near the sea. No cleaning fees. Property 27: The perfect retreat for nature lovers with stunning views of the sea! 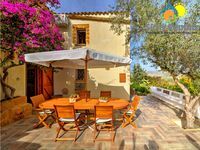 Villa Katiuscia with private pool, garden, near the beach, wifi free. Property 31: Villa Katiuscia with private pool, garden, near the beach, wifi free. Property 40: Villa Euribia ... a corner of peace in the heart of Santa Marina! This home is amazing! Everything is brand new inside and outside. Two full baths and two king beds were perfect for our group. We didn't allow enough time to stay at the house and enjoy the porch and the views. We only stayed 3 days and should have spent a full week. The home is a short drive from the water, but the view was absolutely perfect! The retaining wall blocks out homes that are lower and closer to the water. The landscaping is beautiful as well. Google Maps did bring us to the property through some areas that we would have avoided at night, when coming in from the airport at dark. The host was right on time despite our late entry and was very accommodating. He had restaurant suggestions and places to tour - he shared pins for many of these locations.